These recipes are the top choices for the big game. Of course, chicken wings and true barbecue are always a great option. While most people will be dishing up their favorite snacks and desserts, you can go the extra yard by serving BBQ Ribs, pulled pork or beef brisket. Barbecue can be kept warm and makes great finger food that fills you up—your Super Bowl guests will surely appreciate the effort. 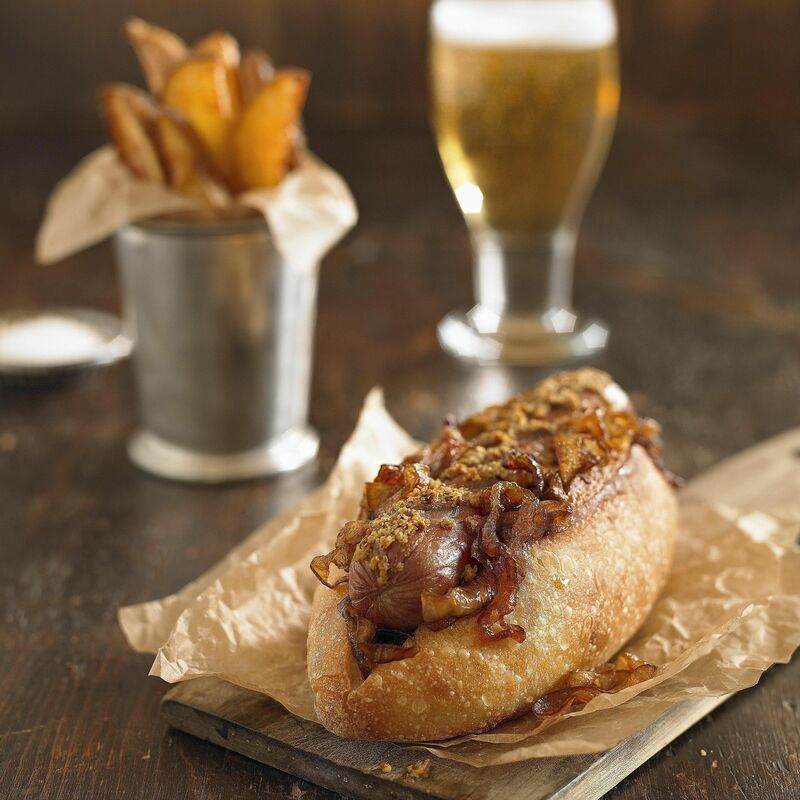 A vendor style New York hot dog that comes topped with a delicious onion sauce. Easy to prepare and a great choice for game day. This is sure to be one of the best gourmet burgers you'll ever try. Large, well-seasoned patties are grilled to perfection, placed onto toasted Ciabatta bread with melted cheese and topped with a delectable port wine spread. Definitely a great burger for any occasion. You can never have too many chicken wing recipes! Try this Thai inspired recipe the next time you have a party. I guarantee that your guests will love it. What makes these meatball sandwiches stand out above the rest? Well for starters, its shape which is similar to kofta kebabs, allows the sandwich to hold together better. Second, it's served up on garlic bread. If you love gyros, you will love these succulent lamb sliders. Not only are they easy to prepare, but packed full of flavor. If you love salt and vinegar potato chips, then you'll love these tangy wings. Add a touch of cayenne pepper to the marinade to boost its spiciness. These ribs are mouthwatering good! If you're throwing a huge cookout, this is the recipe to use. It calls for ten racks of ribs! You can always alter the recipe if you're making a smaller quantity. Despite what you might think, this is a classic hamburger. Legend has it that this burger was invented in Utah. I guess they know their burgers! If you are a fan of black and blue steaks, you will definitely love this burger recipe. Topped with a blue cheese-mayonnaise mixture and hot fresh off the grill Vidalia onion slices, these mouthwatering grilled burgers make a great addition to any cookout. These tri-tip sandwiches are perfect for any kind of game night, cookout, or family dinner. If you love steak tacos, then this recipe is sure to please. A wonderful go-to recipe for weeknight grilling or any casual get-together. There is no better way to spend time with family and friends than by sharing the open fire of a charcoal grill. When preparing my family favorite rib recipe, I like to tinker with dry rubs to keep friends and family on their toes with flavor. Chicago-Style Hot Dog: Load It Up!